In a medium bowl, combine the garlic paste, the olive oil, mustard, and dry ingredients and mix until smooth. Add the pork to the bowl and stir to coat evenly. Allow to stand for 10-15 minutes before grilling. While meat is marinating, soak skewers in water to discourage burning. 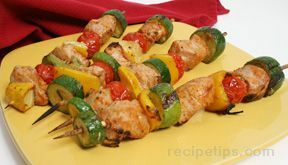 Thread the pork and vegetables onto skewers, alternating ingredients. Any combination of vegetables can be used. Grill over high heat until pork is barely pink, approximately 4-6 minutes.